While Walt Disney made his way to New York City, his backer, Charlie Mintz, was going behind his back. Mintz saw little value in the Disney Brothers because Walt could hardly draw. Mintz set out to create his own studio, convincing the entire Disney crew of animators to join him. Stunned by the betrayal of Mintz and his employees, Walt vowed never again to work for anyone but himself in August 1927. This was a defining moment not only in the history of Walt Disney Studios, but in the history of American entertainment. Riding back to California, Walt sketched almost every type of character that was already used by other cartoon makers. His mind alternated between his friend backstabbing him, terrified by the need to start all over, and drawing an entirely new character. Inspired by Charles Lindbergh’s solo flight across the Atlantic, Walt drew a story about a mouse that builds a plane to gain the attention of a girl. His name was to become Mickey Mouse. Some would say that Mickey Mouse was much like Walt himself – he often failed, but always bounced back. When faced with a setback, he would get up, dust himself off, and start all over again. Turning Mickey Mouse into a success was to become a test of perseverance and faith. Trusting in his own creative judgment, Walt had his team work on a third Mickey Mouse cartoon called “Steamboat Willie,” which was influenced by Charlie Chaplin. He needed a way for his cartoons to stand out among all other cartoons. Walt wanted more than just sound and music to the cartoon. He insisted on music match-up. His creation made history. I grew up around everything Disney. Walt Disney may not have been able to draw much, but he is an “artist” to me. His ideas and sketches are what brought Disney characters to life. Walt Disney created much of the early animation himself and realized he needed Ub Iwerk to help him clean up his final designs. In the end, Walt Disney was able to make Mickey Mouse entertaining as well as educational. “That It Was All Started By a Mouse.” Youtube. Uploaded by, Julianna Bove, February 22, 2016, https://www.youtube.com/watch?v=zBNXOvTJmwA. The above quote by Phillippe Vanderberg came from an interview with fellow artist Ronny Delrue, regarding his upbringing in Belgium. It stands to illustrate the philosophy behind much of his work and was part of his unyielding spirit that made him a cult favorite among so many. "At the heart of the Philippe Vandenberg's work is a primal poetry, one that emerges both from the images he brought to life and from his formal invention". I chose this artist, not only because his art really spoke to me, both stylistically and metaphorically, but because I relate to his ideologies and upbringing. In India, I was raised in a society and school bound heavily in rules, and love the idea of setting free on a canvas, unconstrained by style or theme. Each of his works is unique in that he almost goes out of his way to make sure he isn't conforming to any particular style or practice, and the results are truly spectacular. 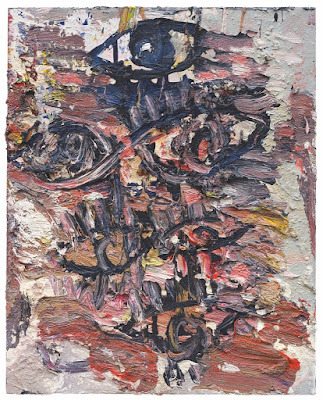 "A key aspect of Vanderberg's paintings is his treatment of surface--his emphasis on accretions, accidents, and reworkings--is of equal importance". This is especially seen in the below painting. His work seems to be covered with grubby, muddy strokes, representing the organic process of painting and repainting. 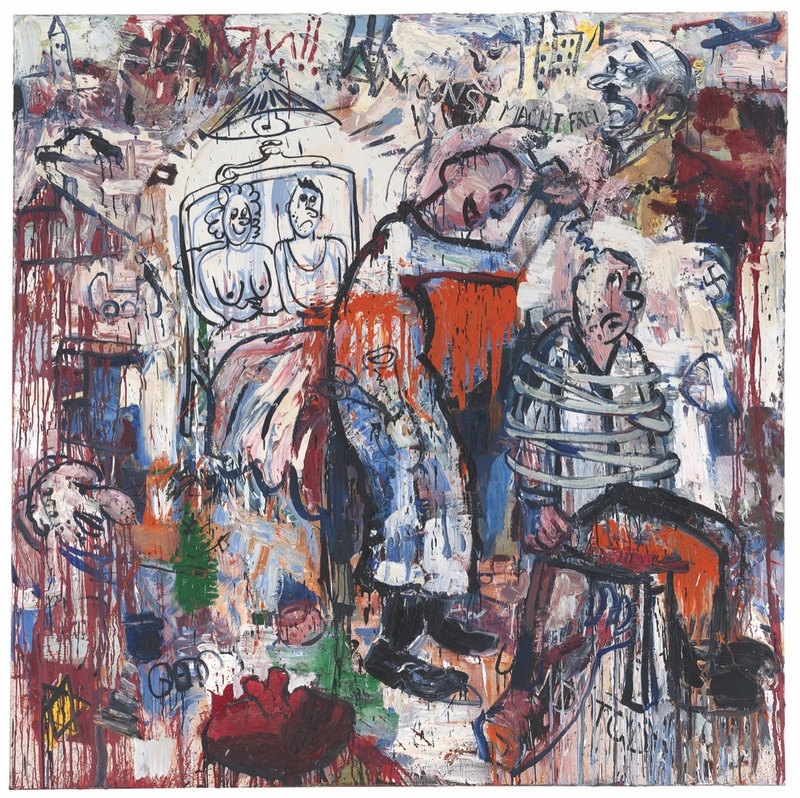 This leaves the surface of his paintings almost as rough, primitive and violent as the imagery they represent. Philippe Vandenberg, La Notte (The Night), 1990. 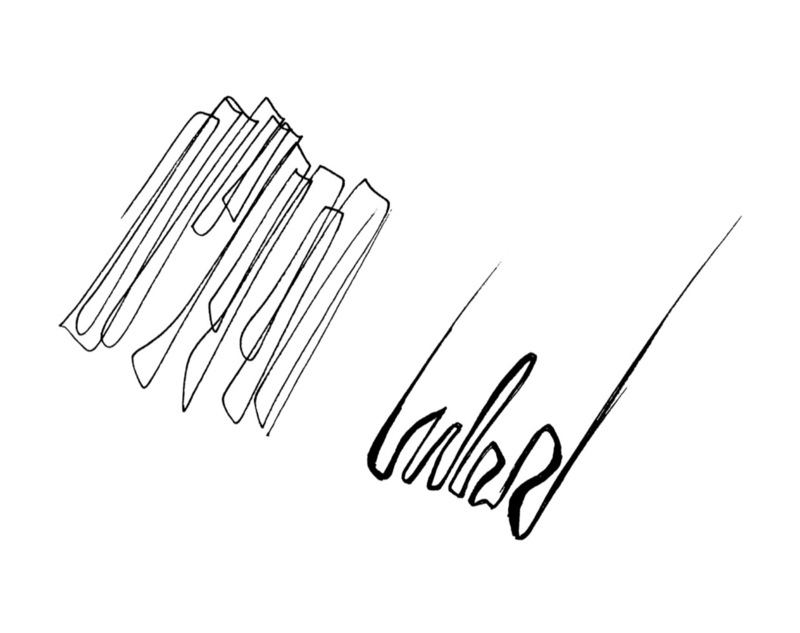 In this next work, we see the artists signature style of starting with an abstract composition. 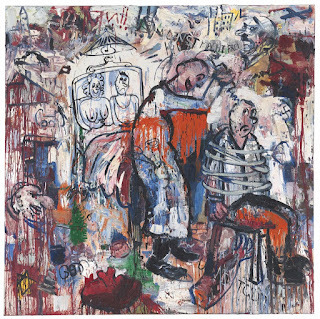 After which he layers onto it cartoon figures, depicting everything from bizarre acts, like what appears to be a man drilling into another's head or a couple in bed. A key aspect to draw from this shows how unconstrained by themes or styles this artist is, as he seems to go wherever his mind takes him. He could go from depicting cheerful picnics to a lunatic asylum. Once again we see how this sketch not only refuses to conform to a particular style but also just shows the artists sheer lack of care, regarding the rules or thoughts of others on his work. And although this drawing is different to his previous abstractions It is similar in its attitude and serves to demonstrate that the artist goes wherever his wits taken, unstoppable by anything. Born in 1950 to an upper-class family, Iraqi-British architect Zaha Hadid's striking parametric designs feature sweeping curves and perspectives, while creating a sense of fragmented reality. The first woman to win the Pritzker Architecture Prize, Hadid--later dubbed "Queen of the Curve"--passed way in March 2016, after a 40-year career. 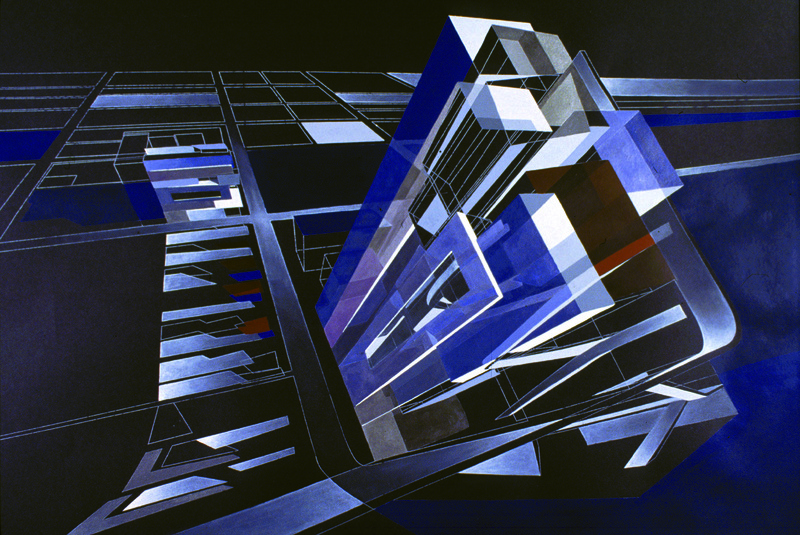 Hadid had studied mathematics at the American University of Beirut. Afterwards, she attended the Architectural Association School in London, and established her own firm--Zaha Hadid Architects--in 1979. Hadid's style is difficult to classify, and she claimed she did not identify with any particular school or movement. 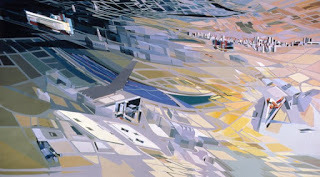 However, critics have used labels such as deconstructivist, parametric, and abstractionist to describe her work. 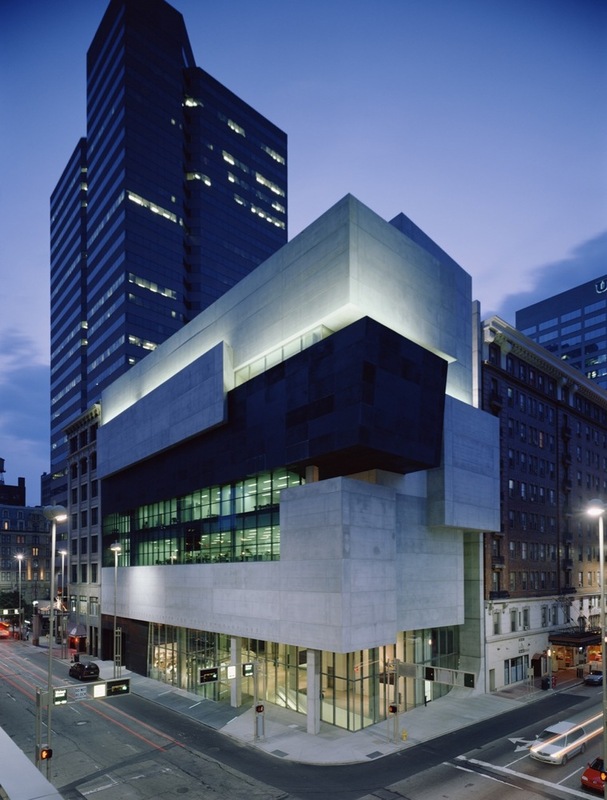 Hadid herself once said of her style: "The idea is not to have any 90-degree angles. In the beginning, there was the diagonal. The diagonal comes from the idea of the explosion which "re-forms" the space. This was an important discovery." In addition to her stunningly modern architectural structures, Hadid also produced a plethora of paintings and sketches to document her ideas. These work differ from the practical architectural drawings so common to the genre in that they are works of abstract art in and of themselves. The relationship between her drawings/paintings she creates during her design process, and the finished building, is something I find very interesting. 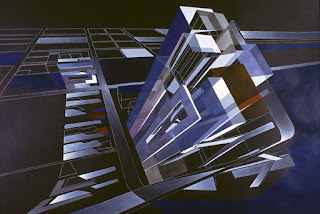 While I've long been an admirer of Hadid in an architectural context, I want to further understand how she used abstract drawings and paintings as part of her creative architectural process. 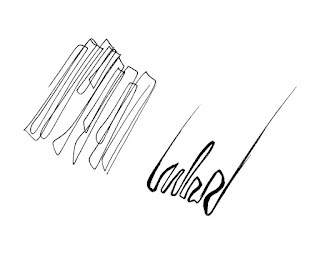 These images are just two of many such examples from this project, but they provide a glimpse into Hadid's mindset for the building. 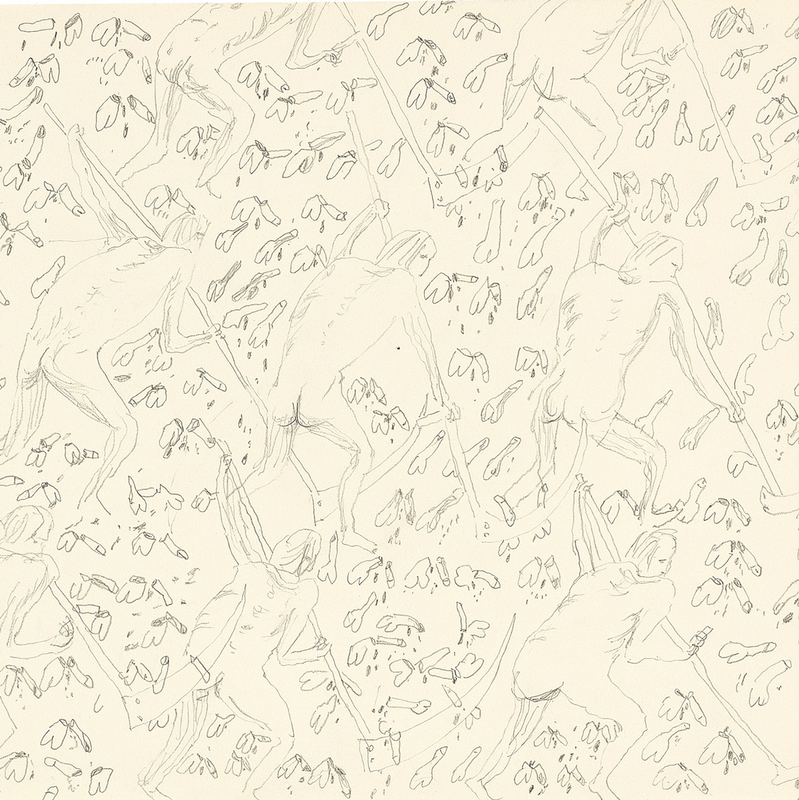 The visual simplicity of the line drawings belies the depth of the exploration of abstraction and fragmented geometry. 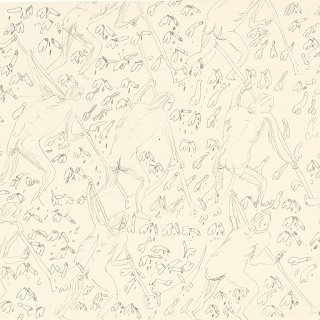 The painting seems to expand on some of the motifs in the sketches--particularly in the way it uses a series of overlapping rectangles to create form, and in its dynamic motion and use of space. The multitude of perspectives captured in the one image borders on a more cubist interpretation of a collage. For comparison purposes, below it a view of the completed Rosenthal Center's façade; note the use of rectangular masses to create the structure, and how the form compares to Hadid's earlier concept drawings.